An event to distribute water tanks to the temples and Pradeshiya Sabhas in drought affected area was held on 25 September 2014 at Governor’s Secretariat. 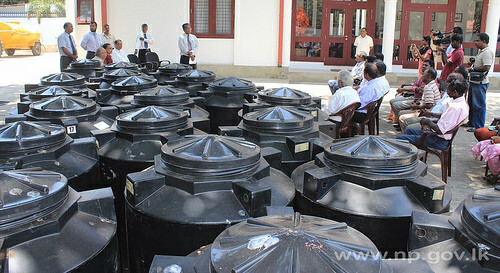 Governor of Northern Province GA Chandrasiri participated as the Chief Guest and distributed the water tanks. As many parts of the country, the prevailing drought has badly affected the Jaffna life. 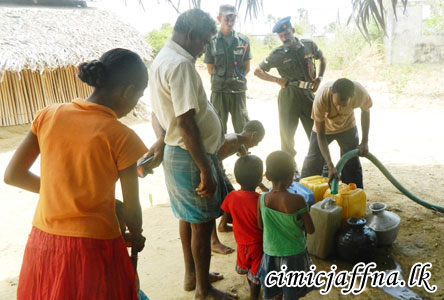 Jaffna did not get the average rainfall nearly for two years and this situation has dragged them to difficulty of finding water for drinking and domestic use. 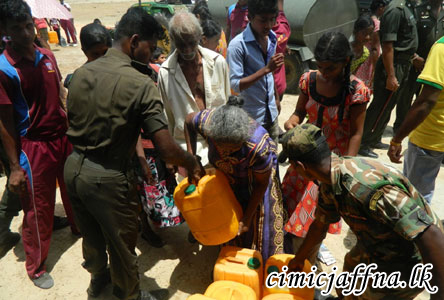 To assist the people of Jaffna suffering due to lack of water, troops serving in different areas have started providing drinking water to civilians at battalion level. Plastic water tanks are put up at public places in addition to bowsers travelling round the villages. At present, water is supplied to most affected areas in the 55 and 52 Divisions. However, on directives of the Commander Security Force Jaffna, the project will be extended to other required areas under supervision of respective Generals Officer Commanding and Brigade Commanders soon.